The NHL Winter Classic is an annual event held by the National Hockey League (NHL) on or around New Year's Day in which a regular-season hockey game is played outdoors. The first Winter Classic was held in 2008. The 2012 Winter Classic was in Philadelphia. The ice rink was on the baseball field of Citizens Park, home to the Philadelphia Phillies. The NHL has done a good job of promoting hockey and the fans absolutely love the idea of an outdoor game. I didn't attend the Winter Classic. I watched it on TV curled in front of a warm fire. Watch the video below to check out the crowd, the ice and a goal scored by #10! The Alumni Game was held on Saturday with many hockey heros in attendance. My favorite was John LeClair and Eric Lindros from the 1990s. I also got to see the famous Bernie Parent (Hall of Fame goaltender who won two Stanley Cups with the Philadelphia Flyers in the 1970s). 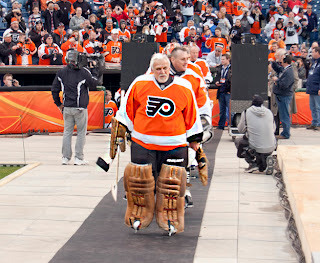 The newer generations of Flyers fans know Bernie as a guy in a white mask that was really good at hockey. They never had the chance to actually see him play. It didn't matter that he is 66 years old. The fans gave him a curtain call after he left the ice. Fitting, of course, because he only made the return for those fans. It also was sweet that the Flyers beat the Rangers in the Alumni game. Unfortunately my team didn't win the game the Winter Classic game. Even though they lost the game I believe people around here will recall the entire weekend (from the sold-out alumni game, to the tributes to former Flyers great, to the orange coloring of the fans in the stands, to the Liberty Bell ringing when the Flyers scored, to the little kids playing on the adjacent rink, to the snow) with a smile on their face! I absolutely love the Winter Classic. It was in Chicago recently (as I'm sure you know! ), and I didn't attend either, but OH how fun to watch it... and to watch the snow coming down during the game. I love how this just feels like a game for the fans. Bummer about the Flyers though! LOVE your NEW header. We're not big sports fans, here. But the idea of having a WINTER CLASSIC and ALUMNI GAME sounds like FUN. Glad you ENJOYED them both. Sorry about your team, though. Take care. LOVE hockey! But I have a confession. I have no idea why I love it, especially since I have no idea of the rules. I'm lame. Hockey is so much fun to watch. Very high pace and keeps you entertained. Diva ~ if you are like me, you like the fights! haha!